Does the daily routine of organising your medications and prescriptions take up too much of your valuable time? Try Webster-pak® … the safe, easy and convenient solution to medication packs. Many people face the daily routine of taking a number of pills and capsules in the right combinations, at the right time. Not only the elderly face this issue. Anyone taking multiple medications on a regular basis could benefit from a Webster-pak®. Webster-pak® is a safe and simple medication pack. It sets out all the tablets and capsules that need to be taken at each particular time of the day, for each day of the week. 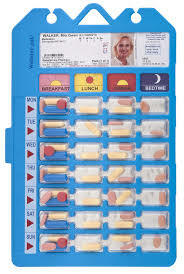 This makes it easy to manage medication. The pharmacist takes the doctor’s prescriptions and dispenses the medication into a blister pack. This pack is securely sealed so the medication is protected and there is no chance of spilling or mixing things up. When it is time to take the medication, the person simply pushes out the contents of the blister through the foil backing for the correct time on the correct day. Webster-pak® provides a visual cue, so you always know where you are up to. It is as easy as that! If you decide to start a Webster-pak® we will do everything for you. We can follow up your prescriptions for you from the Doctor. We can deliver or post the Webster-pak® to you. All you have to do is take your medication.